Rev. Henry EDWARDS, Rector of St John's Church, has been appointed by the President of the United States Chaplain to the several hospitals of this town. 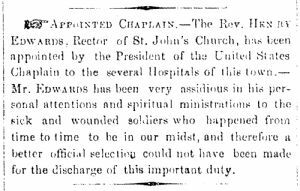 — Mr. EDWARDS has been very assiduous in his personal attentions and spiritual ministrations to the sick and wounded soldiers who happened from time to time to be in our midst, and therefore a better official selection could not have been made for the discharge of this important duty. The letter requesting appointment of a chaplain and President Lincoln's approval of the request was recently returned to the National Archives. See Lost Lincoln letter returned to the Archives Washington Post, Aug 18, 2011.